The below column originally appeared in the South Philadelphia American in 1998. South Philadelphia has it's share of the drug problem, to be sure, but we are blessed in comparison to the "Badlands" of North Philadelphia. 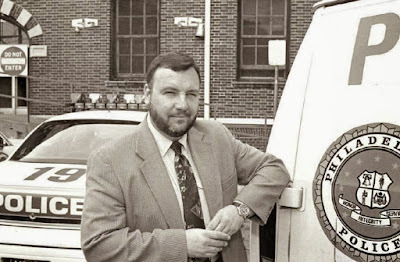 "Operation Sunrise," the joint Philadelphia and federal government counter-drug action mounted to combat the severe drug issue in the Badlands and elsewhere, was the idea of Philadelphia Deputy Police Commissioner Sylvester Johnson and Lawrence P. McElynn, the Special Agent in Charge of the Philadelphia Office of the Drug Enforcement Administration (DEA). I spoke to McElynn about the anti-drug operation recently when he was my guest on Inside Government, a public affairs radio program that I help produce and serve as an on-air host. The radio interview program, sponsored by the Philadelphia Federal Executive Board, airs on Sunday mornings at 6:30 on WMGK 102.9 FM and repeats at 7:00 on WPEN 950 FM. "When Deputy Commissioner Johnson was appointed, we met at a diner and had a discussion about making a real partnership between the DEA and the Philadelphia Police Department to address the drug problem," McElynn told me on the air. "Our focus was to go to an area in the city that had the biggest problem and create a task force to operate there." McElynn said Johnson took it a number of steps further, realizing that they had to deal with much more than just the drug problem in trying to return the neighborhood back to the people who live there. Johnson brought in a number of other departments that could two cars, seal houses and remove graffiti. But both agree that drugs remain at the core, noted McElynn. Drug addicts steal, rob and murder to make money to buy drugs. "Normally, you drive up to the neighborhood, roll down your window, you give them money, someone gives you heroin, and you drive away," McElynn said. "But two days after Operation Sunrise, it took us six hours to find someone to sell us heroin. But the real test will be in the long run. The drug traffickers are testing us, waiting to see how strong our commitment is. But we're here to stay." McElynn said the DEA agents are working at different levels in Operation Sunrise. Some of them are visibly assisting the police officers and some are operating covertly to develop information that will take the operation to a national and international level. A classic case of partnership, McElynn said. "Drugs are coming at us at every level of sophistication. Drugs are coming in commercial cargo shipments in the thousands of pounds and people are bringing pounds in suitcases," McElynn explained. McElynn recounted an incident they had recently where someone had swallowed 99 condoms tied with dental floss and filled with 10 grams of heroin each. "High purity levels, high demand and high availability, plus low prices, always cause addiction to rise. There are probably a million addicts in the U.S., up from 600,000," McElynn said. McElynn said that the marketing strategy of the drug traffickers is to have high quality heroin at low prices and addict as many people as they can, and then over time lower the quality and raise the prices. Heroin is the most serious health threat in the U.S., McElynn told me. "There has been a dramatic shift in control of the drug market in the U.S. in the past couple of years. Right now the Colombians sit at the top. They are in charge of cocaine traffic in partnership with the Dominicans coming through the Caribbean basin and the Mexicans coming coming through the western and southwestern part of the U.S.," McElynn explained. The Colombians have also started to take over the U.S. heroin market, forcing out the Southeast Asian traffickers, McElynn added. "Users have a romantic notion of heroin being the chic thing to do, something that is fashionable as portrayed by parts of the media, but they are being sold a bill of goods that just isn't so. When the drug takes hold of you, life becomes unbearable."